Step 1: Preparing your scope mounts. The first step in mounting your rifle scope is to check if the scope mounts have an arrestor pin. An arrestor pin or recoil pin is a small metal pin protruding from the bottom of a scope mount. 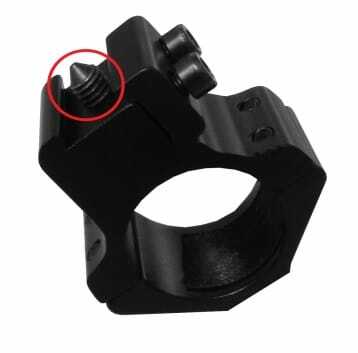 This pin will stop the mounts creeping back when the weapon recoils, however it is unnecessary to have a recoil pin on a pre-charged air rifle. Recoil pins can be either threaded, or pushed in. 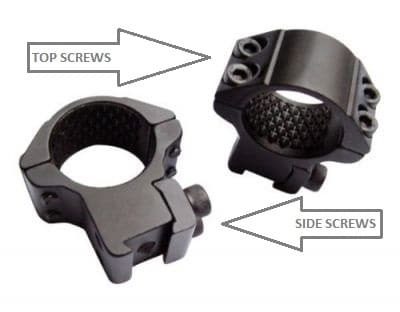 There is a huge range of different rifle scope mounts available. Please take a look through our website for the various options. To remove the recoil pin, you will either have to screw it further into the body of the mount so that it isn’t protruding, or remove it entirely. Depending on the mount it may need to be screwed, pulled out or knocked further in. If you do not remove the recoil pin and it has not slotted into a hole on top of the scope rail then the back mount will be pulling the scope upwards and you may risk bending the scope. If you have a slot on your rifle then the recoil pin will simply sit in. Start by removing the top half of the mounts by unscrewing the screws on the top of the mount. This can be done using the allen key provided with all new sets of mount. Now loosen the side screws, but do not remove, and place the mounts on the rail on the top of the gun. Finger-tighten the side screws so that the mounts don’t fall off and then place the scope in the mounts. You can slide the scope backwards and forwards until you have the correct eye relief. This is normally when the rear of the scope is in line with the centre of the grip. Place the top of the mounts back over the scope and tighten all the screws slightly. Now shoulder the rifle and check that the eye relief is at the correct distance and that the cross hairs are level. With the screws being slightly tightened this will allow for you to make any adjustments to the scope. Once the scope has been set the correct way for yourself tighten up all the screws on the top and side of the mounts. Tightening the top screws as opposites each time will ensure that the mounts do not pull the scope over to one side. To zero your air rifle scope (get it shooting accurately at the point you are aiming at) you will need to make a few adjustments. Set up a large target at a close distance, for example a large cardboard box at ten meters. We find shooting at a plain target when zeroing allows clear view of where the pellet as landed. Aim the centre of your crosshairs at a set point on the target, you can make a mark when a pen for example, and take your first shot. If you are looking for air rifle targets to shoot at, then there is a large variety available online. 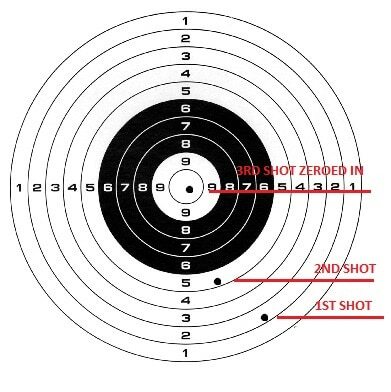 At this point your air rifle will most likely be shooting away from the centre of the crosshairs as seen in the diagram below. Now it’s time to adjust the turrets on your scope. The top turret on the scope controls the vertical adjustment and the side turret controls the horizontal adjustment. Remove the turret covers and adjust as needed. If you are shooting low turn the top turret in the direction that it says “UP”. If you are shooting right turn the side turret in the direction that it says “LEFT” or “L”. We find the easiest way is to think of it as if you are moving the pellet to where you are aiming. Always aim your crosshairs at your marked spot. Make small adjustments each time before your next shot. Shoot the target again and the pellet should be closer to the aim point than the last shot. Once you are shooting accurately at your set mark, take the target out to a further range 10-30meters) and repeat the process until you are at your desired distance.